Whether due to a sudden accident or gradual decay, missing a tooth is often stressful for patients – and less than ideal for their health. Three Tooth Replacement Options explains how a missing tooth affects more than just a smile and the options for replacement: implants, fixed bridges, and removable partial dentures. This video will clearly explain the tooth replacement process before, during, and after each type of tooth replacement procedure. Your patients will feel more at ease knowing there’s a solution to their missing tooth, and understanding their options. Use it to provide patients with a high-level comprehension of tooth replacement procedures. Each Toothflix video you purchase is instantly accessible through your online ADA e-bookshelf. To learn more about the Toothflix video series, visit ADA.org/toothflix. 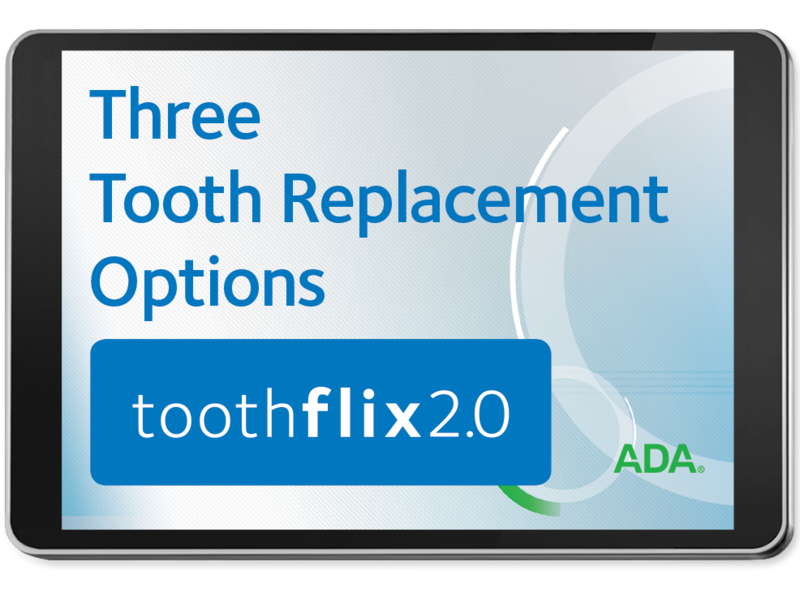 Order your Three Tooth Replacement Options – Toothflix® 2.0 Streaming Video today!